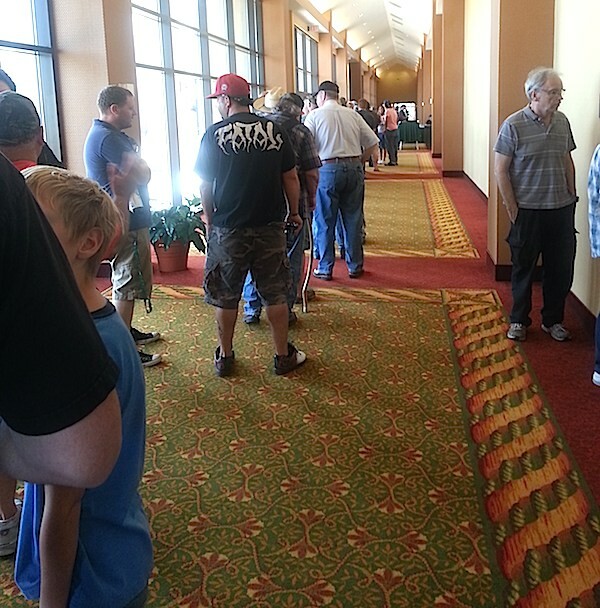 This is a brief review of the Mesquite Gun Show on July 12, 2014, sponsored by Tier-1 Gun Shows. This is my first review of one of the Tier-1 shows. I arrived just before 9AM to a largely empty lot. It’s hard to make anything of this since in light of a panic, gun shows are well into the summer doldrums, especially in an already oversaturated market. Here is a picture of the line just before opening, taken with my back against the glass door. As you might expect for mid-summer in Texas, no one wanted to wait outside, so the line wrapped around to the opposite wall on the inside. Tier-1 had people moving to the side and checking guns before opening, so the line kept moving forward until the show opened promptly at 9AM. 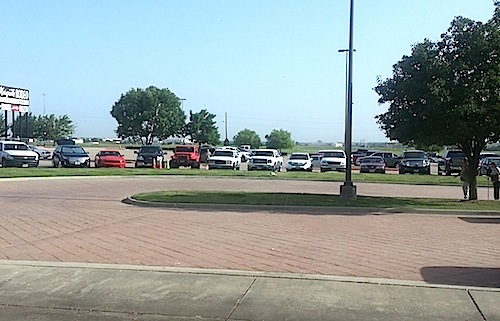 Here is a photo of the parking lot, taken from inside the hallway. Pretty sparse. The floor, however, was filled to capacity with a mix of familiar vendors and some unique to the Tier-1 shows. There were some big names not in attendance, but I noticed a pretty broad mix of firearms in my first sweep across the floor. I also noticed that traffic just kept tricking in a few people at a time. By 9:30 AM, there was a decent group of people walking up and down the aisles. And, it kept tricking in all day. I also noticed buyers. Every couple aisles I walked, I never failed to notice a 4473 being filled out. Most of the interest I observed seemed to be handguns. I left the show just before noon and there was still a line of half a dozen people waiting to get into the show. 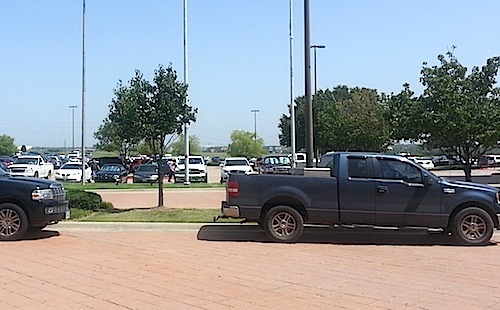 Here is a picture of the lot taken just as I walked outside. The lot was full and a number of cars were parked across the street. Here are a few of the things that caught my eye while walking back and forth across the floor. Summer is generally a good time to buy. Several vendors noticed me recording prices and noted their willingness to make deals. I’d happily take advantage if I had the $$$. As always, prices listed (unless otherwise noted) are for NIB models and cash transactions. The two items I would have bought in an instant were the Razorback 6.8 package and the POF .308. Unfortunately, wallet size does not match desire. Thanks for spending part of your day at Texas Gun Show Review.